Last week, if you’ll recall, my biggest gripe was that week four seemed to go by too quickly, that by putting every one of the individual stories into the same issue made it so that none of them were given ample time to develop anything. This week, the story focuses on one of the smaller stories, rather than skipping all around. It focuses on Steel and the return of the lost space heroes almost exclusively, save for a couple pages for us to see Montoya drinking beer and being a lesbo, which, hey, that’s cool with me. There’s one part I picked up in there, where they mention that her stake-out from last week took place on Kane Street, and it got me to thinking. Vic Sage, the Question, told Renee to call him Charlie last week. Charlie Kane. Coincidence? I don’t know, but I think that’s pretty damn cool and yet another reason to think that the Question may be the biggest badass in this series. We’ll have to wait until it’s all over to decide if he can out-cool Black Adam (who is yet again missing in week five). What exactly did happen to the heroes who were out in space during the Crisis, though? Glad you asked. They answer it all in week five. During the aftermath of repatching a gigantic rift in space (where Alex Luthor was horsing around with the Multiverse), a lot of the heroes were killed or exploded, like the Red Tornado. A bunch of the others, however, were teleported using Adam Strange’s zeta-beams. Alan Scott lost an eye, Hawkgirl became twenty-five feet tall, Firestorm and Cyborg were fused together, and that one guy from the Titans got a voicebox belonging to the Red Tornado fused into his chest. 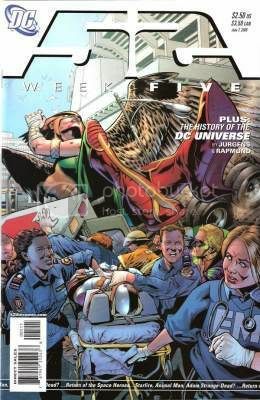 This issue, Steel and Alan Scott are trying to help out at the hospital to fix these unfortunate metas. While at the hospital, the Red Tornado voicebox activates and reveals his final words before ‘sploding. “It’s coming!” it says. “52! 52!” Since it makes no mention of One Year Later, it makes me really pumped that there’s more to the title of this series than the number of weeks in the missing year after the Crisis and before One Year Later. That it has significance beyond that is AWESOME. The conclusion of the story shows us that Animal Man, Starfire, and Adam Strange (sans eyes) are actually still alive, on some sort of paradise planet. The only catch is that they’re not alone. Whatever else is there is ominous and evil. If they don’t eat any apples, I think they’ll be fine. Starfire’s also naked in this scene, for all you sick degenerates out there that get your jollies from that sort of thing. Either way, see ya in seven.